Simple Q: will I notice the difference with UFB? 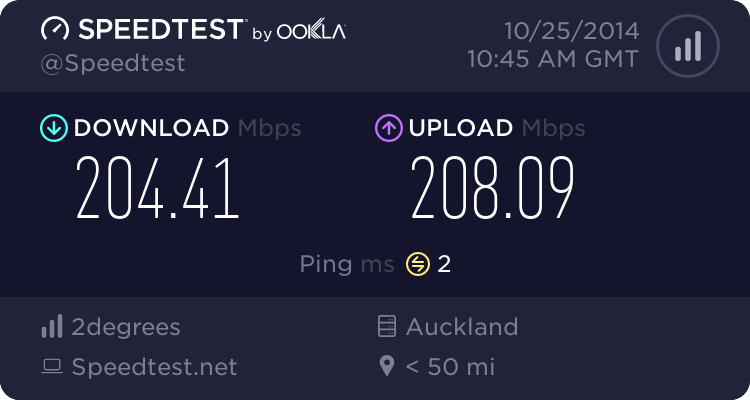 Forums › New Zealand Broadband › Simple Q: will I notice the difference with UFB? I am on ADSL with Spark with current download speeds of 2.4 Mbps in the evening, It is pretty frustrating. We are due to get UFB in abut a month. Without getting too technical, will I definitely notice an improvement with the basic up to 30Mbps plan compared to ADSL or is it not that simple? Yes. And if you find you still need more speed. All you have to do is just contact your ISP and switch to a faster plan. You will see an even bigger benefit if you have more than 1 person or device using the net at the same time in your house. Hell I went from VDSL to fibre and noticed a drastic increase in my speed. So yes, yes you will. Maybe, your question is phrased about your perception, which is difficult to judge. You're already getting 20Mbps, a jump to 30Mbps isn't really that noticeable, and you'll probably only get a speed increase with multiple downloads (torrents) or local content. You will likely notice lower latency. All in all I recommend UFB, but at 30/10 it won't be night and day. 100/20 or something may be. Edit: Unless you're treating it as 2.4 mega*bytes*, but the OP also says that it's frustrating so I'm inclined to think that it's bits. Yes, you will notice an improvement. Shorter ping time is the first thing I noticed, then a faster download speed. Yes. Its not just about bandwidth, but also latency where UFB is a big improvement. You will notice things load faster, snappier. I'm going to be the odd man out here and say the answer is "It depends what you do with your connection"
if you use your connection for stuff like email and browsing of simple websites (e.g. online banking), whilst there will be a difference, it might be not be all that noticeable in your day to day usage. e.g. instead of taking 0.5 seconds to load a site it might take 0.1 seconds. but for anything that requires a bit more bandwidth - video streaming, image heavy sites, file downloads etc then yes you will notice a difference. Likely a BIG difference. Thanks for your responses. It is indeed a slow 2.4 which makes streaming frustrating.